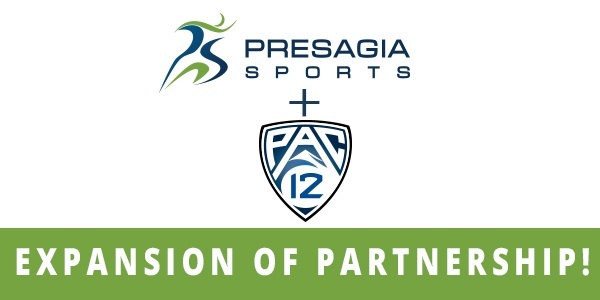 Presagia Sports and the Pac-12 are proud to announce an expansion of their partnership to include information related to sport-related concussion. Presagia Sports is a leader in Athlete Electronic Health Management Software, and the Pac-12 is a National Collegiate Athletic Association (NCAA) conference comprised of 12 leading U.S. universities. The Pac-12 have partnered with the NCAA Concussion Assessment, Research and Education (CARE) initiative to establish the Pac-12 CARE-Affiliated Program (CAP). The Pac-12 CAP will serve as a regional hub of the NCAA CARE initiative to expand the collection of sport-related concussion information to include male and female student-athletes participating in the Pac-12 Conference. A parallel Pac-12 initiative provided Presagia Sports’ Athlete Electronic Health Record (EHR) to each of the Pac-12 member universities to record and manage their athletes’ health data related to sports injuries, illnesses and treatments. In addition to helping these schools better manage the health and performance of their athletes, Presagia Sports will now also house sport-related concussion data from the Pac-12 CAP, and securely transfer that data for use in the broader NCAA CARE initiative. Presagia Sports is also developing a research portal that enables the Pac-12 to access and aggregate data across the conference when studying health initiatives. Presagia Sports’ reporting tools allow the Pac-12 to study student-athlete health at an individual, university or conference level. The insights that arise from this data will enable the Pac-12 to make informed decisions on student-athlete health and well-being. "We're pleased to build upon our partnership with Presagia Sports as we strive to make our student-athletes as safe as possible," said Woodie Dixon, General Counsel and Senior Vice President for Business Affairs for the Pac-12. "Adding Presagia Sports' powerful tools to our growing list of best-in-class sports medicine partners will continue to aid in our efforts to maximize student-athlete health and performance, and to better understand, diagnose, treat and minimize concussions." The Conference has a tradition as the “Conference of Champions,” leading the nation in NCAA Championships in 52 of the last 58 years, with 511 NCAA team titles overall. The Conference comprises 12 leading U.S. universities: The University of Arizona, Arizona State University, the University of California-Berkeley, the University of California at Los Angeles (UCLA), the University of Colorado, the University of Oregon, Oregon State University, Stanford University, the University of Southern California, the University of Utah, the University of Washington and Washington State University. For more information on the Conference’s programs, member institutions, and Commissioner Larry Scott, go to www.pac-12.com/conference.